#solo13. Some strange symbols that made it onto our blog originate on Twitter. The “#” (hash) precedes a hashtag, which indicates a Twitter topic. “@” (at) is called a handle, a possibility to contact people. As you might remember from our previous announcements, Roland and me are currently participating in SpotOn 2013, a conference for online science communication. The meeting is held at the British Library in London. This is just a brief update on what #solo13 was about today. 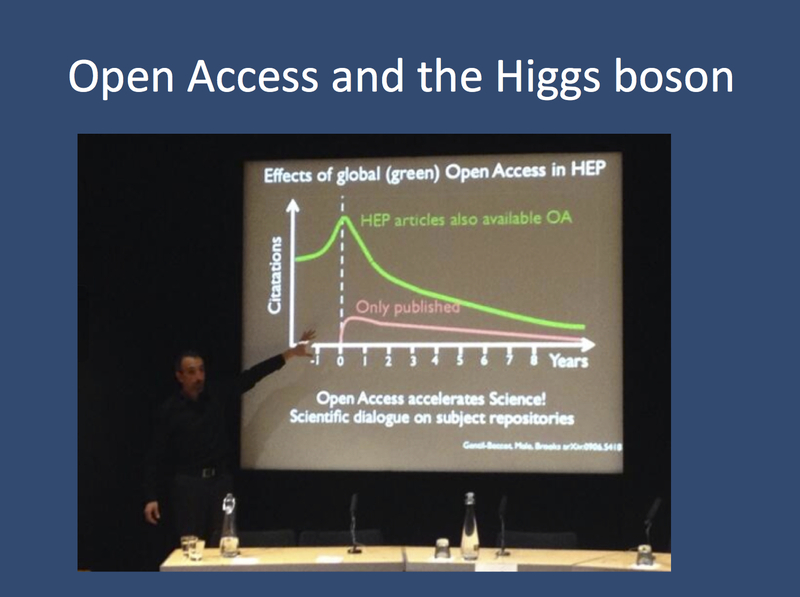 Open Access and the Higgs boson. The central role of CERN provides an ideal opportunity to measure the impact of different publication strategies. Open Access provides a higher number of citations compared to publications hidden behind a so-called paywall. In addition, the data might even be cited pre-publication. [Salvatore Mele during his keynote at #solo13blogs, picture taken by Jon Tennant]. LHC. Salvatore Mele, the head of Open Access at CERN opened the meeting by discussing the discovery of the Higgs boson and the open access policies of CERN. High energy particle physics is the prototype of a large research consortium. Furthermore, this field was instrumental in the development of the internet and has practiced open access for decades, when is was practically preprint distribution. One important slide shows it all (Figure). Open access generates a higher access rate to scientific literature and even provides access to literature prior to publication. With genetic research consortia growing larger and larger, this might be a model for data sharing and open access. The never-ending debate on data shating. In two subsequent sessions on policies and tools for data sharing, the participants tried to answer the basic question whether data sharing can become part of scientific culture and represent more than just a lip service? There are three possible answers emerging from this. Data sharing can be implemented in a top-down approach through official policies. The Wellcome Trust withholds 10% of the grant money is research is not published in an open access manner. Secondly, data sharing can occur in a grass root fashion. Many freely available software tools like Annovar or Denovogear are maintained even though the initial publication is already history. Recognition through the research community and direct feedback can be very strong motivators beyond the impact-factor driven motivation. Microattribution might add to this, but this model is not very well established in life sciences. Third, data sharing can be facilitated by novel data sharing tools. This is a phenomenon that we are already witnessing with access to dbSNP, the Exome Variant Server or, in a more medically relevant context, DECIPHER. The latter has already become a useful tool when it comes to interpreting structural genomic variants and is linked into the UCSC genome browser. Collaborative writing. Coming back to CERN, a large part of the recent Higgs boson publication consisted of the author list. With science going large-scale, we need rules for assessing individual contribution within a larger author list and maybe even measuring part of the writing process. The choice of words to solve these issues might appear strange at first glance when it comes to replacing the traditional publication strategies by discussions about “storytelling”, “narratives” and “threading”. The recent set of ENCODE papers provides a good example of “threading” by deriving various publications with various topics from the same dataset. Is there a journalist in the house? The discussion on journalism, PR reports and press releases is another standard contribution to the socal media discussion. A small tool, sciencegist.com, aims to provide a platform for lay-people compatible with the views of scientists. Several new publishers such as F1000 and elife are now publishing without embargoes although it doesn’t appear as if traditional publishers are going to drop the practice, which is stark contradiction to the papers in high-energy physics. Preparing for our session. We are currently getting ready for our session on blogs for peer-to-peer research communication. While hearing about many of the issues on data sharing and scientific engagement beyond your own professional interest, I just wanted to say “thank you” to our readers. At the “Channelopathist”, we are in the extraordinary position that we are embedded in a tightly knit research community that gives us personalized feedback. This is basically the fuel that our blogs runs on. We’re always happy for comments and please keep on giving us feedback. When we submitted a proposal to SpotOn initially, I described our blog as “the glue of a research consortium”. This is what this blog is for me and I hope that you feel the same. A final word on CERN and big data: in parallel to physics, genomics has become a big data enterprise. There is a nice write-up in WIRED magazine about why this constitutes a problem if we don’t adapt our thinking. This post was written jointly by Ingo Helbig (@ingohelbig) and Roland Krause (@spitshine). This entry was posted in 2013, Meetings, Opinion and tagged #solo13, #solo13blogs, British Library, CERN, Higgs boson, Large Hadron Collider, LHC, London, open access, publication strategy, Salavatore Mele, Science Communication, SpotOn, twitter. Bookmark the permalink.